I keep this information for my own reference, but if it assists you then I'm glad I could help. I use 38400 data rate on my FT450 and FT857D as the display in HRD updates quicker. 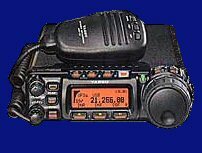 4800 baud is the FT-857D default. Go to Menu 19 to change the rate. Only 1 stop bit is used for OmniRig when using VKCL Logger in XP Pro. Use 2 stop bits in OmniRig for Vista. Do not load prior to starting VKCL. FT2000 - Menu 30 - CAT RTS disabled because I use FT2000 Utilities to program the FT2000. Remember to substitute your com port number - it could be different to mine. (Vista) Right click on Icon / Properties / Compatability* Compatability Mode* Disable Display scaling on high DPI* Run as Administrator DTR & RTS Always on. For N1MM FT1000 DVS keyer setup - see below. Suits all operating systems. NOTE: On N1MM v12 and above, you will have to tick 'CW' on the rig com port. Make a cable using a DB25 male connector. 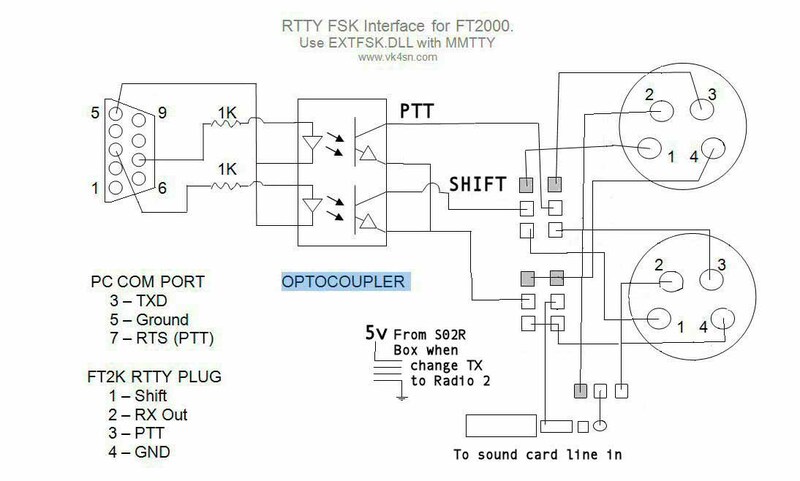 Pin 22 is the FSK TxD line for Radio 1, Pin 23 is the FSK TxD line for Radio 2, and Pin 9 is the return for both radios. The connectors on the other ends of the cable will depend on your radios and/or interfaces. (I could not get the SO2R box to work via the DB25 port, so I designed the circuit below). Make sure that ports 2000 and 4000 are port forwarded in your router. Open windows firewall advanced settings and create inbound and outbound rules to pass both ports. Under "Remote Audio Server", place a tick in the box for "Activate Remote Audio Server" if running as server. Under "Remote Audio Client" - Don't tick anything. Under "Remote Audio Server" (Server Port) - Don't tick anything. Under "Remote Audio Client" (Client General) - Tick Autoconnect to Remote Audio Server when connecting to FT2000RC Server. Save the setup including password and log on. Use Control U to bring up the "keep up to date" window, and select the gif folder on your computer and the folder on your website to keep synconised. To automatically start WinSCP from the Startup folder when computer starts up you will have to modify the WinSCP icon on your desktop and copy it to the Startup folder under program files. After Faros has been running for a while, View Delay Statistics and click into the middle of the green bars. Too many COM ports installed due to USB/Serial adapters being plugged in different USB Ports? Open the Command Prompt as administrator and start the Device Manager from the same command prompt. In the box that opens, select “Show hidden devices” in the ‘view’ menu. Now if you expand the section on COM ports, all the COM ports that have ever been created will be displayed, the non present ones being in grey. You can uninstall away anything that you don’t want (right click, select uninstall). Set up the Remote station first. Restart the TRX Manager and the radio should be working. Clicking on CAT and Monitoring may be required. Click 'Connect at startup' and enter the IP of the remote. In the Host field, enter the IP address of the REMOTE IP. All is working - with any luck.